How to Tell If You Have a Cracked Heat Exchanger | Desert Suns Heating & Cooling Inc. If you have a furnace in your home, it’s important for you to understand what a heat exchanger does. If you’re like the vast majority of homeowners here in Albuquerque, it’s likely that you use natural gas to power your heater—it’s a cheap and efficient resource. 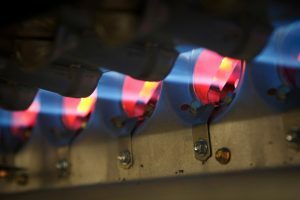 Powering a furnace with natural gas isn’t something that’s inherently dangerous, but the thing is, you need a properly functioning heat exchanger to ensure your home is free from gases like carbon monoxide. If your heat exchanger cracks and you need furnace repair in Los Lunas, NM then make sure that you contact our team at Desert Suns Heating & Cooling Inc. If you’re like the average homeowner, you probably don’t spend your free time reading up on indicators that your heating system is failing. That’s why we’re here. Below we’ve listed a few of the biggest signs that you’re having trouble with your heating system. You Smell an “Off” Odor: If there’s a scent in your home that’s strong and unpleasant, it’s likely that you’re suffering from a cracked heat exchanger. What you’re smelling is the side effect of an incomplete combustion process. If you let this scent move throughout your home unmitigated, you’ll eventually experience other symptoms like headaches, fatigue, and even nausea. Call your local HVAC technician to fix this problem sooner than later. There’s a Build Up of Soot: If there’s a crack in your heat exchanger, things will quickly start to leak out. If you open up your furnace and see a black carbon build up on the surfaces throughout your system then you’ve got a problem on your hands. It’s a great idea to call our team because we can have your system back on track and running like new in no time. The Flame Color is Off: The flame in your furnace should always burn blue. When it’s blue, this means you’re getting the hottest temperature possible to heat your home efficiently. If it’s a yellow color or you see the flame moving in your heating system, that means that it’s time to call an HVAC professional. If you think that you have a cracked heat exchanger, turn off your heater and call a technician immediately. This isn’t a matter that you can afford to put off for long and it’s definitely not something that you should try to DIY. It’s a matter of safety and should always be put into the hands of a professional team like ours. Here at Desert Suns Heating & Cooling, our work is so great because we’ve served the Albuquerque area for almost two decades. There’s really not a lot that can replace experience. We have the right expertise and knowledge to keep your home safe. If you’ve read everything above and think that you might have a cracked heat exchanger in your home, it’s time to contact a professional. Call today to schedule an appointment with our team at Desert Suns Heating & Cooling Inc.